A full map of the project’s findings is to be presented September 9 at the British Science Festival in Birmingham, England. Archaeologists have examined the ground beneath the famous historical site of Stonehenge and found 15 overlooked Neolithic monuments. 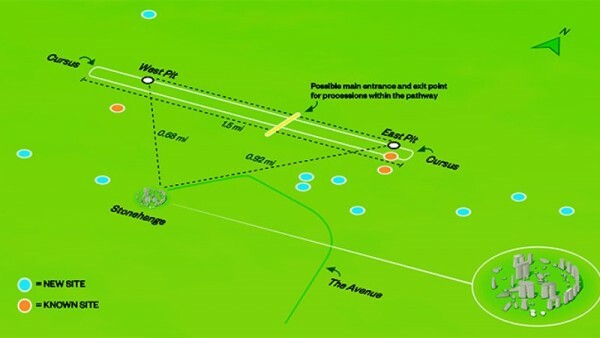 Researchers created a detailed map of what was under Stonehenge with the use of radar and 3D laser scanning techniques. The scans discovered monuments such as pits, segmented ditches, barrows, and even "henges" or ancient circular earthworks. While the monuments are primitive in nature, they suggest an enormous building activity around Stonehenge in the past. Apart from these discoveries, archeologists found a trough or a channel used either for feeding animal or giving them water to drink. The trough, now called the "Cursus," is believed to be aligned with sunrise in the spring and fall equinoxes, said Prof. Vince Gaffney, head researcher and archaeologist. If the trough was purposefully made in this alignment, Prof. Gaffney suggests the ancient monument could have had a more ceremonial process around it. These new findings have opened-up a wide array of interests in the scientific community. Prof. Gaffney currently has a four year collaboration with a British team and the Ludwig Boltzmann Institute for Archaeological Prospection and Virtual Archaeology in Austria. The project is called "The Stonehenge Hidden Landscape Project." Although studies about Stonehenge have gone back centuries, there is still a great air of mystery surrounding the revered site. This project's aim is to contribute more knowledge about the monument by conducting cutting-edge geophysical and remote sensing surveys at a more modern level than has never been previously done. The results of the project will create a detailed map that includes the invisible environment of Stonehenge. The project will combine this data with the common environment to create a bigger picture as to what Stonehenge was built for. People have inferred many meanings about Stonehenge, particularly attaching religious or even alien meanings to it. There is no solid proof to these conjectures, however.